Every year, thousands of unaccompanied children travel to Europe seeking a new life. The majority has fled from difficult living conditions, from wars and conflicts. They have travelled through many countries, without their families, facing extreme difficulties and horrible conditions on their way. Some have suffered from abuse, have been victims of trafficking, or have lost family members along the way. The arrival of unaccompanied children from third countries is not a temporary phenomenon, but a long-term feature of migratory flows to the EU. In 2013, there were 12 690 asylum applications by unaccompanied minors across the 28 Member States, a number that confirms the trend of past years and that is unlikely to decrease in the future. The vast majority of these applications were submitted to few Member States, with Sweden receiving the greatest amount (3 850). But statistics provided by some Member States suggest that the children submitting an asylum application are not the biggest percentage. In Belgium, the number of unaccompanied minors not applying for asylum in 2013 was more than three times bigger than the number of those who did apply. In Italy and Spain together, the number of unaccompanied children who did not apply for asylum exceeded 10 000 only last year. Whilst the majority still comes from Afghanistan, 2013 saw a dramatic increase in the number of children coming from Somalia, Eritrea and Syria, as a consequence of the migratory crisis in these regions of the world. These children arriving alone to our borders are among the most exposed and vulnerable in our societies. Since the adoption of the EU Action Plan on Unaccompanied Minors in 2010, much has been done both at EU and national level to better receive and protect these children, including through legislation, policy and practical measures of support. The EU has played a significant role in supporting policy and practice which respect and protect the rights of all unaccompanied and separated children, regardless of their status. The EU Action Plan on Unaccompanied Minors noted that ”it is fundamental to ensure that any child needing protection receives it and that, regardless of their immigration status, citizenship or background, all children are treated as children first and foremost.” The Action Plan also contributed to foster many practical measures of support in recent years, including through the important work of the EU agencies. In recent years, several key legislative instruments directly addressing the situation of these children were adopted, including, most recently, the completion of the recast EU Asylum instruments. The existing EU legal framework provides good instruments to ensure the protection of these vulnerable children and the respect of their rights. Nevertheless, it is not always straightforward for national authorities and practitioners to navigate through the complexity of legal provisions scattered across several legal instruments. The European Parliament pointed this out in its 2013 Resolution on the situation of unaccompanied children, which called for “a handbook drawing together these various legal bases, addressed to Member States and to all practitioners, in order to facilitate proper implementation by Member States and to strengthen the protection of unaccompanied minors”. The Reference Document produced by the CONNECT project comes indeed at the right time. This document, which constitutes a broad array of EU law, policy and practical measures, should serve as a valuable resource to support policy makers, practitioners and wide range of stakeholders in this field throughout the European Union. We have so far succeeded in setting the legal framework. Now is the time to focus on implementation, to make sure this progress really brings about changes to children’s lives. Compiled by Rebecca O Donnell (Connect Regional Policy Manager) with input from Mikaela Hagan (CONNECT Project Coordinator), the CONNECT Partners and the CONNECT Advisory Panel. 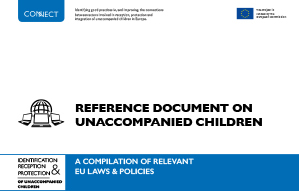 EU Reference Document Table: developed by Rebecca O Donnell, Andrea Vonkeman (UNHCR) and Silvia Cravesana. This tool was produced within the context of the EU funded project CONNECT – “Identifying good practices in, and improving, the connections between actors involved in reception, protection and integration of unaccompanied children in Europe”, 2014. This document has been produced with the financial support of the European Commission. The contents of this report can in no way be taken to reflect the views of the European Commission. Project partners: Save the Children Sweden, UNHCR’s Bureau for EU Affairs, Swedish County Administration in Västra Götaland, Save the Children Italy, Don Calabria Institute, Italian Ministry of Labour and Social Policies, Coram Children’s Legal Centre, and Stichting Nidos. Connect Advisory Panel: Hélène Soupios-David (ECRE), David Lowyck (Minor-Ndako), Tin Verstegen (Nidos), Daphne Bouteillet-Paquet (Save the Children EU Office), Jyothi Kanics (UNICEF), Andrea Vonkeman (UNHCR).